In a clash on the Senate floor Monday, Senate Republican Leader Mitch McConnell said that Majority Leader Harry Reid’s planned move to change the Senate filibuster rule could jeopardize chances of reaching a deal on avoiding tax hikes and spending cuts at the end of the year. NBC's Domenico Montanaro reports that although some Republicans have changed their tone on a new-no-taxes pledge, they aren't putting tax rate increases on the table. The filibuster is the Senate tradition of unlimited debate on bills and nominations. Under current rules, a filibuster can be ended only by a vote of three-fifths of all senators, or 60 senators. Reid said he’s not proposing that the Senate do away entirely with the filibuster, “just that we do away with filibusters on motions to proceed,” the procedural step that precedes a final debate on a bill or a nomination. 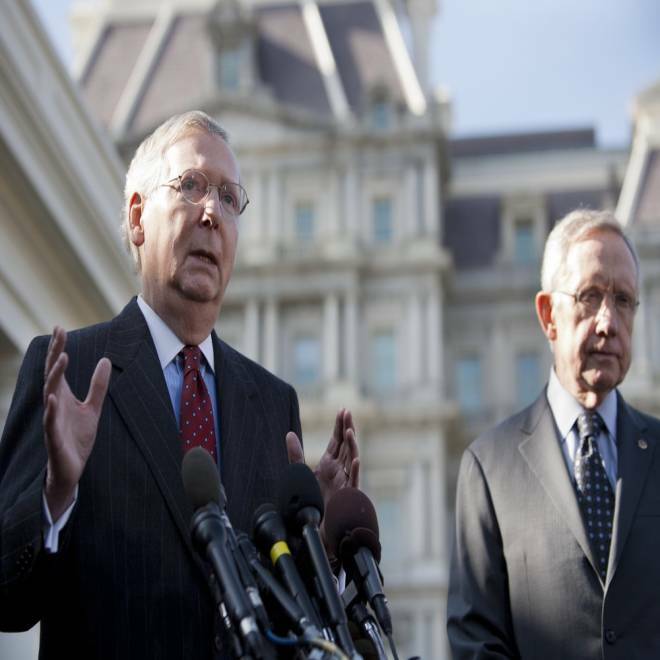 Senate Minority Leader Mitch McConnell (R-KY), accompanied by Senate Majority Leader Harry Reid (D-NV), speaks at the White House after meeting with US President Barack Obama on November 16, 2012 in Washington,DC. Reid called his proposed rule change “minor” and an attempt to make the Senate “more efficient” – but McConnell vehemently disputed that. “This is no small matter, this is a big issue about the future of this country and how this institution ought to be operated,” the Kentucky Republican said. He pointed out that under the current Senate rules it takes 67 senators to enact a rule change. Andrea Mitchell talks to Sen. Bob Corker, R-Tenn., one of the Republican lawmakers breaking with the pledge to oppose all tax increases. But Reid may move in January as soon as the Senate convenes for the new session of Congress to change the rules by a simple majority vote. McConnell said Reid had used his power under the Senate rules to prevent Republican senators from offering amendments on proposed bills. Therefore, McConnell said, the Republicans had responded by slowing or blocking debate through filibusters. If Reid wants to defeat filibusters, McConnell suggested, he should “use the fatigue factor to grind down opposition” by forcing senators who were filibustering motions or bills to stay on the Senate floor and keep speaking.